Liebherr Maritime Cranes has delivered the first out of two LHM 550 to its neighbors in the Port of Rostock, Germany. Euroports Germany wants to increase its turnover considerably with the new cranes. Liebherr succeeded in finding a tailor-made solution for the requirements of the Euroports.Euroports is one of the largest port infrastructure companies in Europe. Euroports develops, operates and manages global maritime supply-chain solutions for international customers in target industry sectors. Liebherr Maritime Cranes already delivered two Liebherr mobile harbor cranes LHM 800 in container configuration to Montecon in Uruguay. End of November Liebherr received an order from Montecon for the third LHM 800 that will start operation in Montevideo, Uruguay next year.In 2015 Montecon ordered the first giant mobile harbor cranes, type LHM 800 in container operation. Due to their increasing demand for mobile container handling solutions, they subsequently ordered a second unit. Both cranes were delivered in 2016. Roll-Lift USA added another Liebherr telescopic crawler crane to its fleet. With the purchase of this highly versatile equipment, Roll-Lift is aiming for change.Whether on a shutdown or on green field project, these machines proof their own strength. They are easy to transport and relocate, self-erecting, have narrow and wide track options, the ability to walk under pipe racks and a good lifting chart.The telescopic crawler crane LTR1220 was already introduced in 2012, but is rather new on the U.S. market. After half a year in operating the seven Liebherr Reachstacker LRS 545, the Transnet SOC Ltd is satisfied by the overall performance of the new devices. In daily operation, the machines have to withstand the harsh maritime conditions in the port of Durban and over the past months, they have mastered this task with flying colors.In December of 2017, Transnet SOC Ltd ordered seven Liebherr Reachstacker LRS 545, which have been dispatched from the manufacturing site in Sunderland, Great Britain, in February. Members of the Liebherr family, Executive Management and Newport News city officials gathered last Friday, July 20 for a groundbreaking ceremony on site in Copeland Industrial Park to celebrate the construction of the new Liebherr USA, Co. headquarters.The commencement of this $45 million expansion project marks the beginning of an exciting new chapter for Liebherr in the United States. The company that has been manufacturing and operating in Newport News, Va. for over 48 years broke ground at the site adjacent to its current location. The Australian port solution provider Qube Ports will shortly receive its eighth mobile harbour crane from Liebherr. Now they also placed an order for their ninth LHM. Qube, the giant Australian logistics supplier with services and facilities in 28 Australian ports, have ordered a LHM 550 for its operations in Whyalla with SIMEC. This will be the ninth mobile harbor crane Qube have ordered from Liebherr in the last five years, with an LHM 420 also currently on its way to Bell Bay in Tasmania. Shannon Foynes Port Company (SFPC) has taken delivery of a new Liebherr Mobile Harbor Crane LHM 420, which was delivered fully assembled by sea from Liebherr’s factory in Rostock. 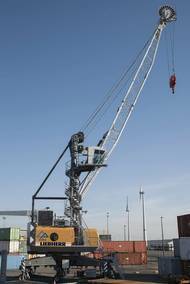 Shannon Foynes Port Company opted for a new Liebherr mobile harbor crane type LHM 420. The addition of this crane is designed to help maximize the potential of the deep water port at Foynes and contribute to the creation of up to 3,000 jobs along the Shannon Estuary. The crane was procured by Shannon Foynes Port Company through a competitive tendering process. 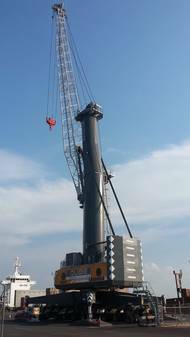 The new LPS 420 E is the latest extension of the Liebherr mobile harbour crane product range. The newly designed machine is a purely electric driven portal crane. 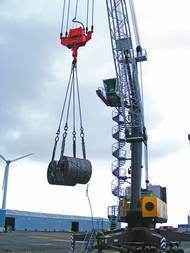 All crane movements like luffing, hoisting, slewing and travelling are done by electric motors. As the LPS 420 E is a member of the LHM series, it is also characterised by high modularity. Therefore, it is a universal all-rounder and a key asset for handling every type of cargo, from containers to bulk, general cargo and heavy lifts up to 124 t.
Switzerland based equipment manufacturer Liebherr Group reports its 2017 turnover was the highest in the group's history, with total sales of €9,845 million.The company’s 2017 revenue increased 9.3 percent compared to the previous year, a trend the group says it believes will continue in 2018.The group posted a net result of €331 million for 2017, an increase of €33 million or 11.1 percent compared to the previous year.Liebherr reported a significant improvement in the operating result in the reporting year. The Belgium port worker training center OCHA recently received a new Liebherr mobile harbor crane type LHM 120. The machine will be used for practice-based trainings of crane operators. Located in the heart of the Port of Antwerp OCHA offers various trainings for port workers. OCHA specializes in practical crane training. 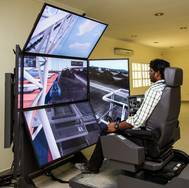 Crane operators can train their driving skills in a realistic environment and get down to business with state-of-the-art material. OCHA belongs to CEPA, a cooperative organization of private port operators. The German port handling company EPAS recently received two new Liebherr mobile harbor cranes type LHM 420. Both cranes together can handle up to 248 tonnes in tandem lift operation. 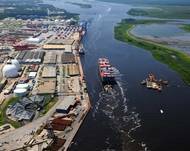 The two devices will further improve the logistic process at the Nordkai terminal in Emden, Germany. Mobile harbor cranes have a long tradition for Ems Ports Agency & Stevedoring (EPAS) Beteiligungs GmbH & Co. KG in Emden, Germany. To further increase the turnover capacity, the German port company invested in high-end mobile harbor crane technology from Liebherr. The Dutch logistics service provider Kloosterboer and Liebherr Maritime Cranes mark their 20 years of partnership with a port equipment order comprising a new mobile harbor crane and a new reachstacker. Kloosterboer, founded in 1925, provides logistics services in Western Europe for temperature controlled food products. The Dutch family company with more than 800 employees in nine locations in the Netherlands and six abroad is now managed by the third generation. The growth of Kloosterboer is closely linked to the sizes of their Liebherr mobile harbor cranes. Bothra Shipping Services Pvt Ltd. has taken delivery of a new Liebherr LRS 545 Reachstacker for its Kakinada Port container operation. Furthermore, Bothra is awaiting delivery of a new Liebherr training simulator. Liebherr has delivered a new LRS 545 Reachstacker to Bothra Shipping Services Pvt Ltd. at Kakinada Port. 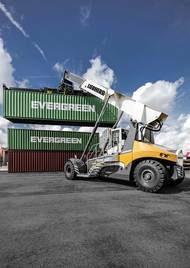 The new Reachstacker is being used at Bothra Shipping Group’s busy port for container operation predominantly for the stacking of containers inside the terminal.